They are done. They are sent. Be warned target. Be warned. Bwaaa-haaa-ha-HA! Three words for you foodies out there. Pumpkin. Pie. Crepes. Yeah, I know. It's pretty much genius. My Fella and I have taken to having crepes for breakfast most weekends now. 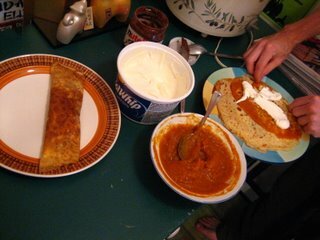 Our stand-by fave is Nutella but I had this brainstorm to use pumpkin pie filling and whip cream for crepes this time. Holy smokes is it ever good. Try it. You won't regret it. We also made a trip down to the newest addition to Vancouver's handful of yarn shops. Three Bags Full on Main Street. 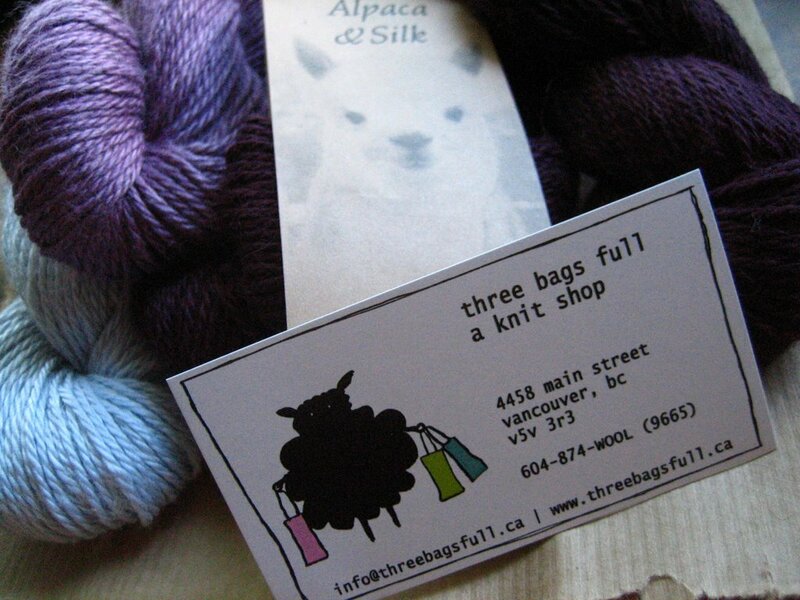 I picked up some Alpaca&Silk by Blue Sky Alpaca for a shrug I am thinking about knitting. 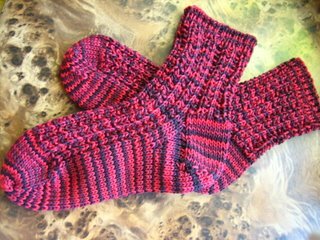 I was also contemplating some more yarn (of the same) for a pair of gloves for myself but decided against it. Just to save some money, you know. That is when my Fella stepped in. Though he is one to poke fun at me and my yarn addiction sometimes, he is genuinely understanding about the whole thing. Sweet even. Sweet because even after I decided to come back for the glove yarn later, he went ahead and purchased the yarn for me. Just because. 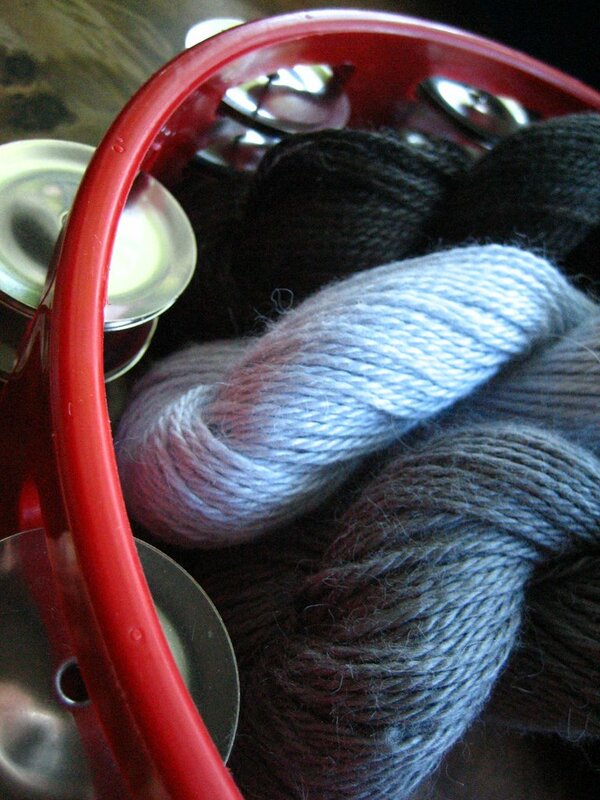 The picture above is the yarn he got me, along with the new red tambourine he got me a couple weeks ago. Those were the nice parts of this past weekend. But I have been sick and woozy for the better part of the last 2 days. Bleh. I'm off to get some chicken noodle soup and Pride and Prejudice. The good, 6 hour A&E version. Not the Keira Knightly crap. 2. The second rule of Sock Wars is, you MUST talk about Sock Wars. 7. If this is your first time in Sock Wars, you have to fight. The rules are straight from Sock Monkey's site. I might have sentenced myself to death here, but I'll do my best. Me: I think my stash is lacking. My Fella: It might be lacking if this were a yarn shop. This is an apartment, not a yarn shop! Finally. Finally I got sick enough of having yarn deposits all over the apartment and taking over the bedroom. Now with this new shelf unit my yarn is all in one place, and it's sorted by color! Right now I have the yarn out in the open as shown in the photo above. But I will be picking up ziplocs or something similar to keep my yarn in. Before it was just random bags of all shapes and sizes. Like a crazy yarn-obsessed bag lady. 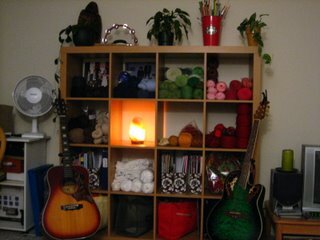 But now that I have a large all-in-one storage area for my yarnie things, it looks kind of empty. So I think I will have to make some new purchases soon. You understand, right?